A lot of people are asking me how the new book is doing, so here's a quick update. Eden's Revenge was released mid-April and - for reasons still not clear, as it's in `english - shot into the French Amazon (Science Fiction) Space Opera charts, taking the first two books along with it. They all hung around in the top 100 for about two weeks. Since the launch, all three books have been doing quite well in the UK; for example, this morning, Eden's Revenge is back in the top 100 Space Opera books with the other two hovering just outside. 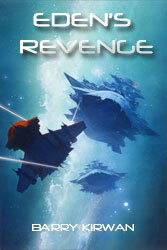 Eden's Revenge is in the top 100 Space Opera in Germany this morning. Now, you're probably thinking, this guy checks Amazon all the time, right? Actually, no, I just happened to check my blog and noticed a spike in German readership of the blog, and lo and behold, there was a corresponding spike in German sales. The great thing about the recent sales is that it has involved all three books. My publishers and I always thought this might happen - science fiction readers like trilogies (I know I do), and so brand new readers are discovering the series. US sales have been slower - the price is maybe a bit high for an ebook version, but my publisher and I have confidence that it will take off there, too, as sales of The Eden Paradox and Eden's Trial have been highest overall in the US market last year. 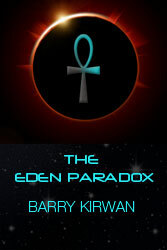 We are sorting out when a paperback version of Eden's Revenge will appear, sometime between September and Xmas. I know a bunch of readers will wait until the paperback appears - not everyone is kindle or nook-friendly. For those of you who have already read book 3, you know there has to be at least one more book, and you're right. It will be called Eden's Endgame, and will be the final episode (I'm not planning a 'prequel', though a number of people have asked me about that, since the origins of the Eden saga are in the 11th century. However, the Prologue of Eden's Revenge is set in the sixteenth century, so is a kind of mini-prequel. One bit of hot news is about the cover of book 4. 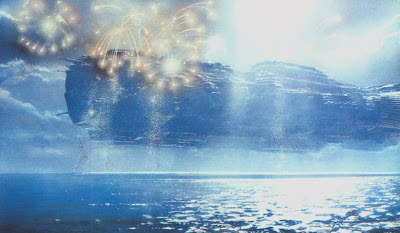 Readers might have noticed that the cover of Eden's Revenge was by a professional science fiction artist, John Harris, who for example did the cover of Firebird for Jack McDevitt. I love his work, and he's been commissioned to do brand new artwork for Eden's Endgame. I've sent his agent some paragraphs from the series involving 'cool alien ships', and the Alician home world Savange, and he's going to send back some sketches over the summer, then we'll decide. I have to say that this is pretty exciting for an author, to be able to participate in the cover design; it happens less often than you'd think (I've been involved in all four of mine, so I'm lucky). "Masterful science fiction, outstanding finale"
"The scenes play out like a movie you can't look away from." "Fast action, good characters, tight plot." "Some people cannot write multiple threads and sub-plots, and some are masters." "Couldn't put it down, lost sleep over it, left me wanting the next one." "Eden's Revenge literally tears the humanity out of some of its characters." "Terrific action, credible aliens, a pitiless universe - but humanity is worth fighting for nonetheless." "Planet-busting sci-fi. A page-turner from beginning to end."